This entry was posted on August 8, 2010 at 9:37 am	and is filed under BARRETT Franklin. Tagged: Franklin Barrett. You can follow any responses to this entry through the RSS 2.0 feed. Both comments and pings are currently closed. 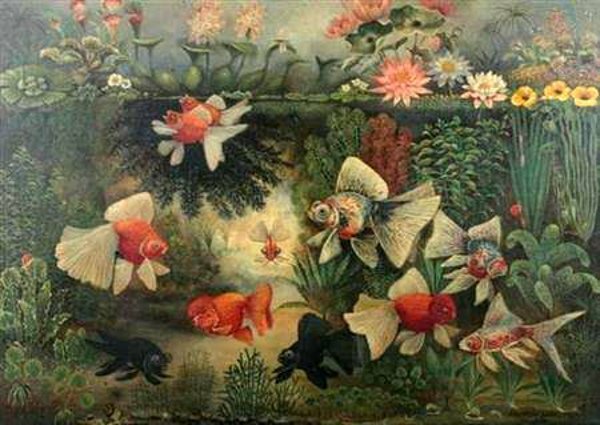 I believe this may be a painting by my great grandfather Franklin Barrett from Philadelphia who also was well known for his illustrations of fish and owned an aquarium in Philadelphia. He passed away in 1958. The style of the painting looks like his and the signature matches other paintings I have in my home. Is there anyone who know the history of this painting? I don’t know the details of this painting. However, my wife Dorothy was Franklin Barrett’s Granddaughter. Her Mother was Helen Ida Barrett who was Franklin’s daughter. We have one of his original still life paintings in our home and I can send you a picture if you are interested,. We live in Bucks Co, PA.
HI! Of course, Dorothy and Willard Moore. I am Harry & Jean Class’ daughter, Cathy, Franklin’s great granddaughter! We are related! Do you know how many pictures Franklin painted? We have a few as well and my favorite is one very similar to the last one shown above. I would love to see a picture of the one you have. How are you doing Willard? It is nice to hear from you. 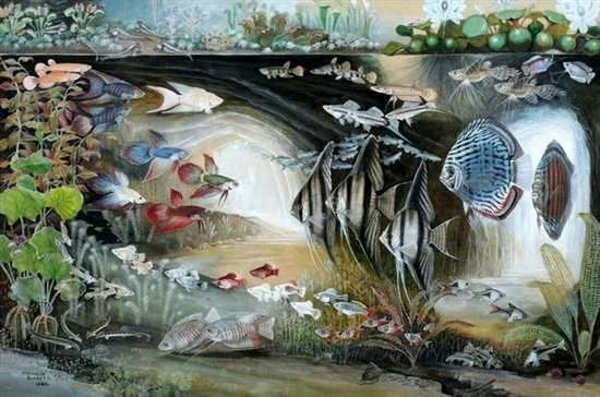 I remember some of the paintings and I think Norman Lock, Jr (Skip) has one or two paintings, but I don’t what they are. If we can communicate via email, then I can send a picture of the one I have. It is a still life of a beautiful pink rose with the same signature that shows up on the other paintings. Unfortunately, my wife Dorothy died about 11 years ago and I am now re-married for almost 9 years to Norma. I have a Franklin Barrett painting dated 1943. 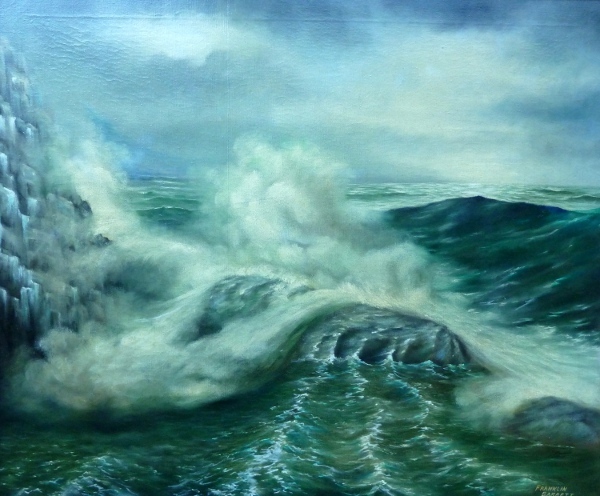 It is a painting of a storm at sea. It is called “Rocky Coast”. It has a price of $500 on it and it was given to my father-in-law Joseph L. Fox, an attorney, who represented FB in a case which had to do with one of his paintings deemed to be pornographic. He took the painting in lieu of a fee. Hi Howard. My email is classzewski@verizon.net. Thanks so much, I look forward to seeing the picture. I sent the photos (4) twice and it failed. I have now sent them one at a time. I hope you got them. Thank you Howard, I replied to your email. Hello Willard, Cathy and Howard. 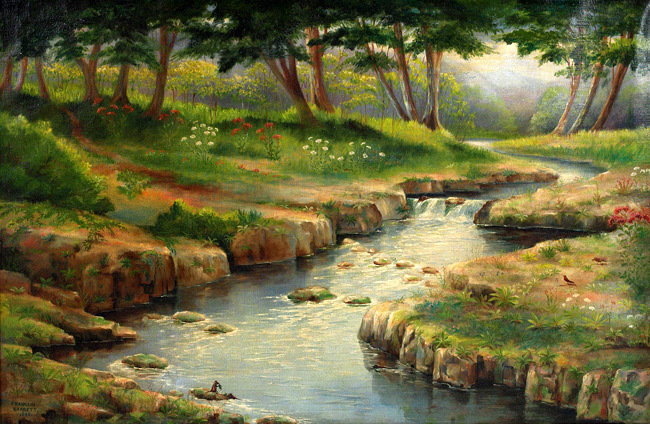 The paintings posted here are really wonderful. Franklin Barrett married my grandfather’s Aunt, Gertrude Young. Apparently my grandmother was very fond of one of his paintings that hung in his store for quite some time. But he was not willing to part with it. I would be very interested to see the paintings you all have, if you would like to share photos. My email is LHerdman@hotmail.com. Thanks very much. Hi LInda! so you are related to me in some way…how would that work? Franklin Barrett is my great-grandfather on my father’s side. My father’s mother’s father. My father’s sister was named Gertrude. Do you have any idea what the painting was that your grandmother liked? i so wish there where pictures of the inside of the store as i would love to see his murals. i will be happy to send you a picture of my picture. if it is ok with everyone here, i would like to include everyone in the same email so we could all see each other’s pictures. would that be ok with everyone? thank you!